DAVAO CITY today is hardly recognizable from the days when it was just a sleepy one-note town with a lone hotel and a central shopping center filled with tribal handicraft, as visitors breathed in the air sweetened by the heady scent of ripened durian. And mind you, that was just less than 30 years ago. Today Davao is suffused with as much sophistication as Manila, sans the choking pollution and rampant petty thievery. Its marketing slogan “From Islands to Highlands” says it all. It caters to a myriad of visitors —from extreme adventurists (Mount Apo mountain climbing) and wildlife enthusiasts (Philippine Eagle Center), to shopaholics (SM Lanang Premier and Ayala Corp.’s Abreeza Mall) and spaholics (Lazuli Spa, Marco Polo Davao); from sports enthusiasts (ziplining and wakeboarding) and beach bums (Samal Island), to foodies trying to further enrich their palates (Malagos Garden artisanal goat cheeses). 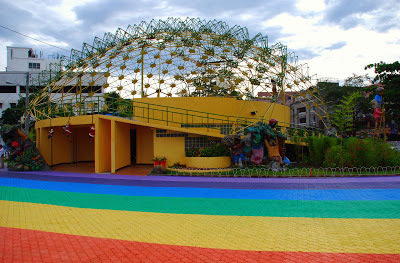 The People's Park with its Durian Dome is a landmark in Davao City. Residents enjoy relaxing under its shady trees, and appreciate the parks sculptures, water features, etc. Rich culture and history. 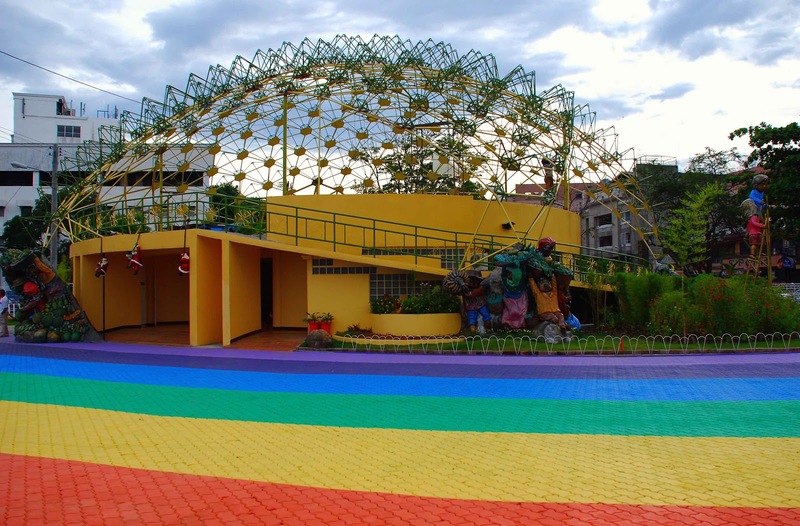 Take a walk around the city, starting with the People’s Park (Jose Camus and J. Palma Gil streets), whose main entrance is outfitted with a durian-shaped dome. Amid the lush greenery are sculptures depicting the indigenous tribes of Davao by local artist Kublai Millan. From there, go to the San Pedro Cathedral (San Pedro Street and C.M. Recto Avenue), said to be the oldest church in Davao, whose original structure was built in 1847. It has undergone several reinventions with its current façade supposedly designed to resemble a vinta, the traditional boat used by the Badjao tribe of Mindanao, gliding over the water. Last, check out Museo Dabawenyo (Fr. Selga Street), which showcases the rich and culturally diverse history of Davao. Featured are arts and crafts of the local tribes, as well as traditional weaponry, clothing and money. Contact Alex Divinagracia of Globalwings Travel Davao (CP# 0917-7000350/0932-8848198) for city tours. Ten tribes, one vibe. 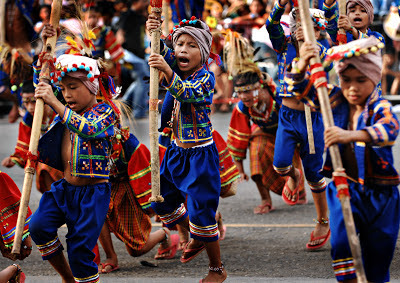 The Kadayawan Festival is the city’s most popular and colorful fiesta usually held every August to celebrate Davao’s rich cultural heritage and the harvest season. It features a parade of the 10 tribes of Davao—with each group donning its unique costumes and dancing to its tribal music—talent and beauty contests; and a parade of floats. The Kadayawan Festival is usually marked with colorful parades as Davaoeños dress in intricately-designed native costumes. Interactive bird show. The Amazing Bird Show of veterinarian Dr. Bo Puentespina is a fun and entertaining way to educate children about Philippine birds and the environment, in general. Dr. Bo’s smart cheeky birds swoop down on the audience as they play their tricks. The show is at the Malagos Garden Resort (Barangay Malagos, Calinan, Davao City), which also features a butterfly sanctuary (what a thrill it is when the critters land on your palm! ), an ostrich and goat farm (its chevre is now served on international flights of Philippine Airlines), and an orchidarium (the world-famous waling-waling is cultivated here). Call (082) 301-1375 or 0917-7008583 for inquiries. Artistic leanings. Colorful traditional tribal weaves and natural products of its indigenous groups are available at the Aldevinco Shopping Center (Claro M. Recto Avenue and Manuel Roxas Boulevard). The Kublai Art Gallery (5F Yahu Plaza, Bangoy Street) features artworks by local artist Kublai Millan as well as other visual artists. Durian-durian. Some describe it as sweet-smelling day-old gym socks but one cannot argue with its incredibly creamy taste. If you can’t take the pungent smell, there are durian candies and ice cream available in any of the local supermarkets, while Blugré Café sells durian coffee. Durian, mangosteen and other local seasonal fruits can be purchased at the fruit stands beside the Aldevinco Shopping Center. Have tuna 10 ways! The freshest of tuna lands in Davao daily. You can have your fill of this fleshy fish in 10 exciting ways at Marina Tuna (Km. 8, Barrio Pampanga, Sasa). If you opt for a breezier meal, head over to Times Beach, where its many roadside eateries will jostle for the recognition of serving the best tuna kinilaw. It is a public beach only two kilometers from the city proper, and easily accessible by public and private transportation. Another worthwhile culinary expedition is to Claude’s Le Café de Ville (Habana Compound, on Rizal Street), which serves authentic French cuisine, and hailed by even some of Manila’s most discriminating French chefs. Noteworthy items on the menu are the pate foie gras, French onion soup, Steak Tartare, Frog Legs a La Provencal, to name a few. Chill-out joints. The Matina Town Square (MacArthur Highway, Matina) has the perfect combination for late night owls—cheap beer and bar chow, as well as good old live music. Kanto Bar and Taboan are its most popular joints as bands with saucy names like the Naughty Notes play. For more rarefied air and spirits, check out Eagles Bar (Marco Polo Davao, CM Recto Street). It offers tapas and a wide list of alcoholic beverages, as well as two giant TV screens so guests can catch the latest sports matches. Getting there: Five local carriers and two international airlines regularly fly to Davao City from Clark, Manila, Cebu, Puerto Princesa, Kalibo, Zamboanga, Cagayan de Oro, Dipolog, Butuan, Singapore and Kota Kinabalu. Getting around: Taxis are the most convenient way of getting around Davao City; all are metered and air-conditioned. What’s more, there are taxi companies like Mabuhay Taxis which accept payments made through ATM or credit cards. Jeepeneys are readily available 24 hours a day as well, plying those routes even not normally accessible to taxis. For more about Davao, go to www.davaocity.gov.ph/davao.